HVAC is a Goonswarm pilot and long-time friend of the site. When he isn’t flying capitals for the CFC or taking charge of Dusties, he can usually be found trolling the comments section of TMDC, EVE-O, kugu, and #tweetfleet. In the early morning hours of December 13th, a freighter pilot from the logistics branch of Goonswarm Federation was on a mission to deploy a new staging outpost. After a series of preventable mistakes, the freighter was destroyed and the station egg lost. Many people, including myself, found the event incredibly hilarious. Phreeze, a staff writer on TMDC, wrote a great article which explained exactly what went wrong and why it died. I’m not going to rehash what he wrote, but instead focus on why Goonswarm was trying to drop the egg while giving newer players a basic introduction to nullsec outposts. 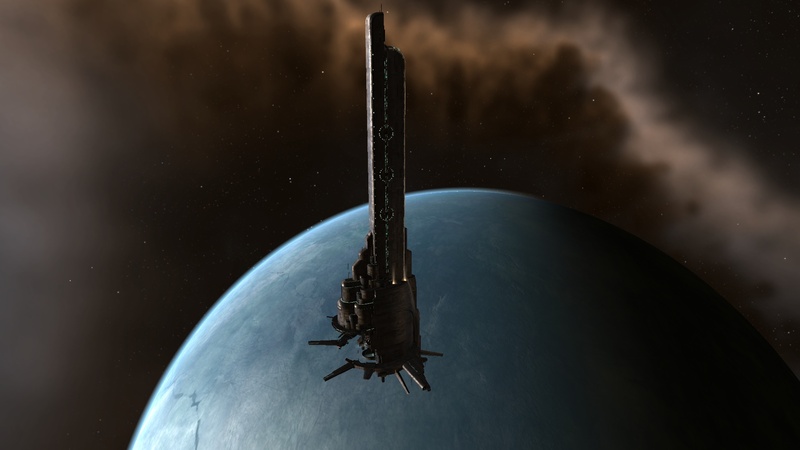 There are two types of structures that a pilot can dock in 0.0 – stations and outposts. The difference between the two is very minimal, the main exception being that stations were seeded with the creation of nullsec and that outposts are player created and deployed. There are four types of outposts: Caldari (Research), Amarr (Factory), Minmatar (Refinery), and Gallente (Administrative). Caldari outposts have more research slots available, as well as bonuses to research time and research materials. Amarr outposts get more manufacturing slots and take less time to manufacture items. Minmatar outposts have a higher base refine and Gallente outposts have more offices. As EVE has evolved over the years, groups of corporations became alliances. Eventually, entire alliances became coalitions. The alliances inside the early coalitions usually did not work together as closely as they do today, and almost never staged together. With the introduction of time dilation in the Crucible expansion, systems were able to handle more players. With multiple alliances now able to base out of a single system, the rarely seen Gallente outpost became a favorite of large groups for one reason: the amount of offices they can provide. To the average pilot, your corp having an office only provides benefit of having the ability to pod yourself to the staging system. However, to corporations and alliances, having an office at an outpost gives you access to corporate hangars, which makes running logistics in a staging system much easier. Combined with the very unintuitive permissions system, you can get creative with what your hangers hold and who can access them. The more alliances with corps that have hangars, the easier things become. With the outpost buff in the Odyssey expansion, coalition logistics became even easier. While dropping outposts is very common (you usually will see a new one every few days on dotlan), dropping them in a theatre of war is very rare. Goons have done it a number of times, most notably in QPO-WI (Deklein), F2OY-X (Querious), and 4-EP12 (Fountain). In addition to the failed operation in 1P-WGB, a previous egg was lost that belonged to GSF pilot Anderton Faln in J5A-IX this past summer, making Goonswarm the first alliance to lose two station eggs in EVE history. As outposts are nullsec’s only non-destructible deployable, many have a desire to see a future mechanic that allows for their destruction. Should such a mechanic be introduced in conjunction with the bad placement of many outposts, it wouldn’t be a shock to see owners destroying their own. It would almost certainly be used to grief smaller entities, and regions like Providence could be targeted for destruction. Finally, I just wanted to say how excited I am to be a part of the new Crossing Zebras media empire. I’m deeply honored to be working alongside the likes of Jeg, Forlorn, and Sindel. Even if it means putting up with that primadonna, Xander.